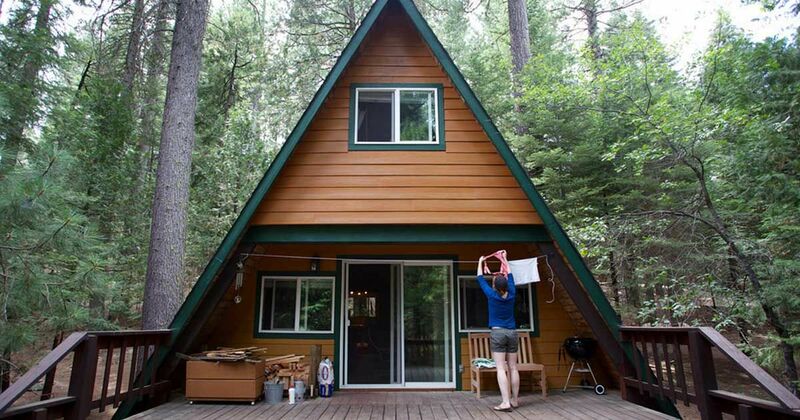 This little A-frame cabin might look tiny - but it's packed with style inside out. We love this shape because it's fun, and a non-traditional take on the classic wood cabin. Its tall peaked roof mimics the tall pines surrounding it, and that big deck is the perfect place to soak up all the nature around you. Once you step inside you instantly feel at home with beautiful modern furnishings juxtaposed deep wood walls, and that ever-charming cabin flare. This is the perfect spot for a retreat because it has everything you need and it takes full advantage of the great outdoors. From here you can see that great A-line roof, and massive deck. The sliding doors open right up onto it so you can really enjoy the indoor-outdoor lifestyle. 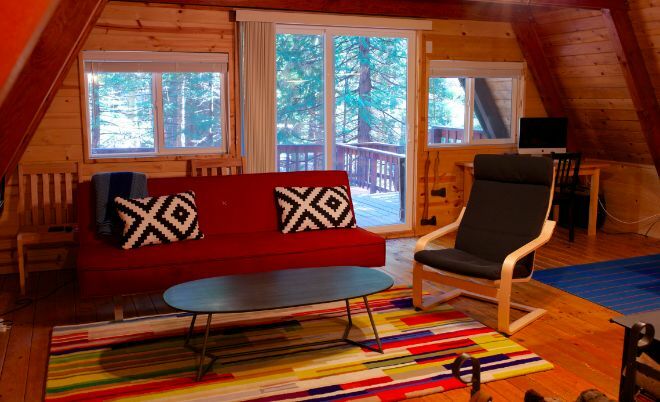 Inside you're greeted by a warm wood burning stove, and comfy furnishings. We love how they've always mixing the old with the new in this house - from the modern steel staircase to the funky furniture. 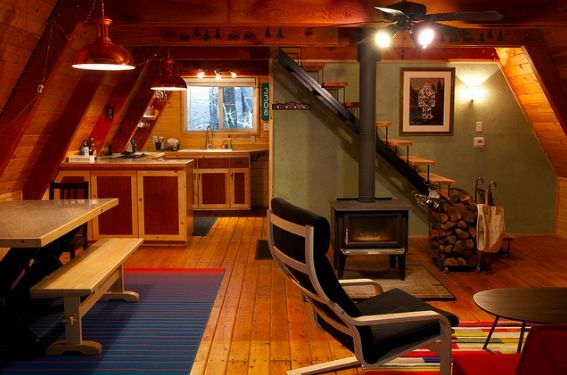 The living area is cozy and warm, and looks right out onto the deck. This is the perfect place to sit back with a cup of hot tea and watch the fire roar, or listen to the rain slide off the roof. 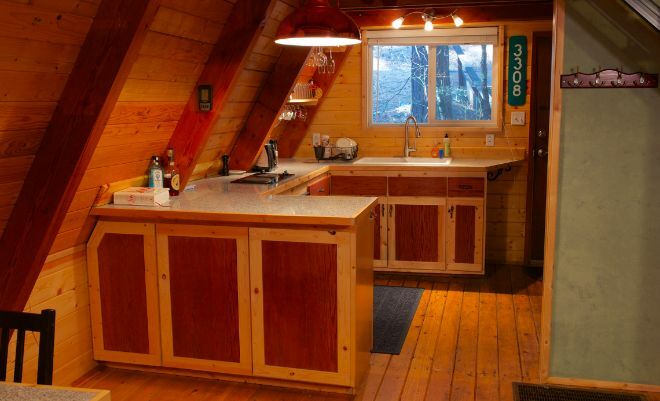 For a relatively tiny home, this kitchen has a lot of great space. We adore the two toned cabinets and those nice stone counters which continue the organic feel of this home. Climb up the stairs and you're brought into a wonderful loft sleeping area. 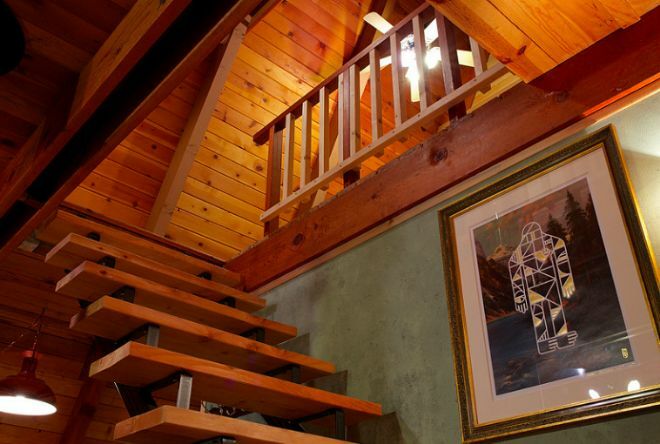 We love these stairs because they're airy and clean - and they really don't take up a lot of physical or visual space in this tiny cabin. 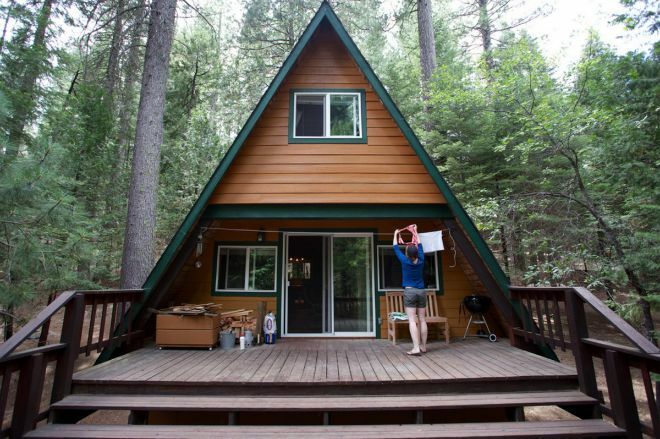 Do you adore this cute A-line cabin in the woods? SHARE with someone you want to escape here with!